My lovely yoga teacher, who is also an Astrologer mentioned that the full moon will be in Scorpio in the next day or so and that people may feel more emotional. I think everyone can recognise the cyclic nature of emotions regardless of what is happening in one’s life or the awareness of Astrology. I have often noticed the affect full moons have on my own emotions, bringing stimulation and excitement, along with keeping me awake at night and sometimes feeling teary and highly emotional. There is clearly minimal scientific evidence around the moon’s influence on our emotions but that doesn’t necessarily reflect one’s own experience. Emotion is a natural part of our human experience and our body has a natural response based on the level and type of emotion we experience. A highly fearful, stressful event will elicit the fight, flight response . When we experience this stress, blood moves to survival mode, to the hindbrain and vital organs. If we think about how else our body might respond to balance this type of stress, it is helpful to know that our bodies do have an innate knowing of what is needed for balance. I will give an example. When we experience or think of a stressful event we will often naturally and without thinking place our hand on our forehead or, put our head in our hands. This natural response stimulates the front brain via 2 points on the frontal eminence of the forehead. These points held by the hands or fingertips help stimulate blood flow from the hindbrain to the front brain, calming the mind, helping to process emotions and helping us to think more clearly. The emotional reaction in the hindbrain begins to balance out as the frontal brain is supported via these holding points and increased blood flow. This allows the brain to process the experience and release the emotional charge related to the situation. We can use this technique as often as needed, for the past, present or future stressful events. It can be very helpful prior to sleep assisting in processing the stresses of the day. Someone else can hold the points for you, which is lovely to receive, and you can, of course, do this for others. This technique is wonderful for helping children to process emotional stress, very effective before sleep. 1) Make sure you are in an environment where you feel safe. 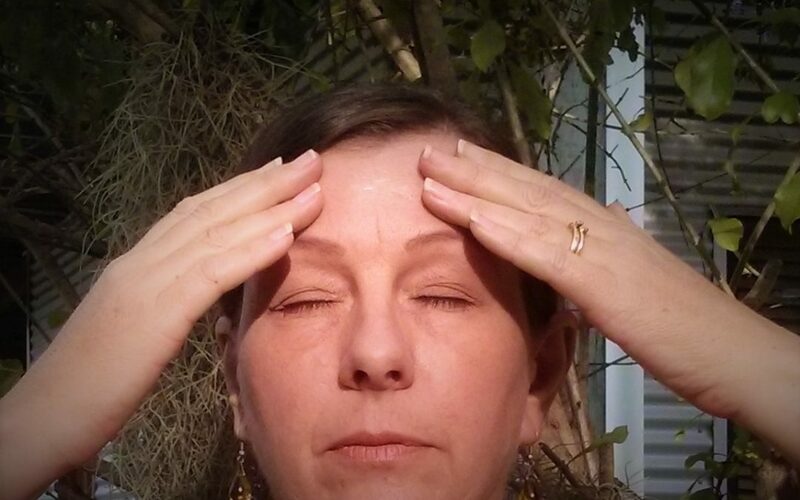 2) Bring to mind the stressful situation and hold the 2 points on your forehead, directly above your eyebrows. 3) Thinking through the situation, focus on the feelings. You might watch it as a movie, running it through your mind a few times. 4) As you release the emotional charge you may find you take a big breath and your mind will begin to drift way from thinking about the experience. 5) Notice the experience return to the hindbrain as a memory without the emotional charge. 6) You may like to creatively rewrite the experience in your mind with a positive and happy outcome, or complete the exercise by thinking of a happy experience with a loving connectedness in your heart.